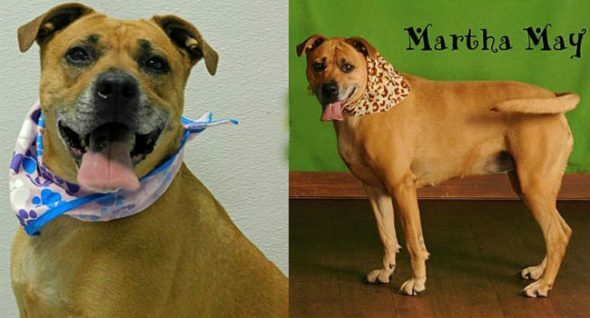 Martha May is a sweet, older lady who loves to be the center of attention. The Grey Muzzle Organization gives grants to shelters and rescues around the nation and a recent gift to the Helping Hands Humane Society in Topeka, KS, has allowed its staff to implement a new program that addresses the physical, joint and dental health to greatly improve the comfort, adoptability and quality of life of senior dogs in their care. Martha May is one of them! This sweet and adorable 8-year-old pit bull mix was brought in as a stray by a kind stranger who found her. She’s a happy girl; she knows this is her last stop before finding her forever home and she’s staying positive while she waits! HEIGHT: 27″ at the shoulder WEIGHT: 65 lbs. HOW MUCH EXERCISE DO I NEED? Regular exercise will keep me healthy, happy, and better behaved. So let’s go on walks. DO I KNOW ANY TRICKS? I’ve got the commands sit and shake covered but I know I can add even more to that list, especially when you motivate me with yummy treats! DO I HAVE ANY SPECIAL TOYS? I haven’t been interested in toys while I am here but when I get home I would love to have squeaky toys. AM I A GOOD INSIDE DOG? With some time to adjust, I will make a great inside dog. I would love to spend as much time as possible with you. Just take me outside to go potty and don’t be afraid to crate me when you aren’t home! DO I LIKE CATS? I haven’t socialized with any felines in my time being here. If you have a furry friend for me at home, please ask the adoption counselors about doing a dog test with me. DO I LIKE CHILDREN? I haven’t been around children while at the shelter, so make sure to bring the whole family in to meet me. I’d love to meet them. DO I LIKE OTHER DOGS? I am an assertive, set-in-her-ways lady who likes to be in charge of the situation. I am a pretty picky gal so it would be best if your companion has a more relaxed attitude. Before going home, you should bring your furry friend in to meet with me!